During the fall we enjoyed a leisurely excursion through northwestern Spain, traveling from Castilla y León to Galicia, staying in Paradors, government owned hotels, primarily historic monuments; castles, monasteries, palaces, fortresses and convents, converted into sumptuous lodgings for travelers. The 5-star Grand Luxe Hostal de San Marcos de León is one of the most splendid examples of Renaissance architecture in Spain today (Note: the Parador is closed for renovation, expected to reopen in 2019). Construction of this stunning historic monument began in the 16th century; it was built to house the headquarters for the Military Order Knights of Saint James, responsible for patrolling the ancient Camino de Santiago pilgrimage route and protecting its wayfarers, and King Ferdinand, the head of the order, financed the project. The most prestigious sculptors and architects worked on its magnificently carved Plateresque façade, its monumental stone staircase, cloister, chapterhouse and intricately carved choir stalls. Through the years the Hostal de San Marcos has served as a pilgrims’ hospital, a college, a prison, barracks and a concentration camp during the Spanish Civil War (1936-1939). It now serves as a sumptuous Old World palace-hotel, attracting discerning travelers from around the globe, along with weary modern day pilgrims seeking a bit of luxury on the long road to Santiago de Compostela. A scene from the Emilio Estevez film staring Martin Sheen, “The Way”, was filmed here in room 363. 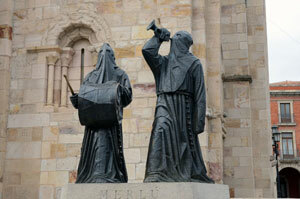 This ancient capital of Castilla-León is also blessed with other fine historic treasures, including its soaring 13th century French Gothic cathedral, containing some of the most extraordinary stained glass windows in all of Europe, the frescoes of the San Isidro Collegiate Church, whose Kings’ Pantheon is known as the “Sistine Chapel of Romanesque art” and the Casa de Botines, a neo-Gothic creation of catalán Moderniste architect Antonio Gaudí. The also city offers an atmospheric Medieval Quarter, where the locals and students gather for evening tapas in the Barrio Húmedo, or “Wet Neighborhood”, alluding to the large amount of wine spilled there each night. It’s one of the best tapas scenes in Northwest Spain, and here it is still customary to offer a free tapa with each drink purchased. Our favorites here: the new and buzzing gastronomic space, La Tienda del Mercado on Calle Varillas and the traditional El Nuevo Racimo de Oro on Plaza San Martín. Moving west to the extremely scenic but far less explored northwest corner of Old Castile, the exciting wine region of El Bierzo, visitors will find a handy base in the modern, newly renovated, Parador de Villafranca del Bierzo, which also lies on the pilgrimage route to Santiago de Compostela. From here one can easily tour several of the regions top wineries, such as Descendientes de J. Palacios in Villafranca, in addition to the Knights Templars’ castle in Ponferrada. The remains of the 1st-4th century Roman gold mining operation, Las Medulas, an archaeological wonder and World Heritage Site is only twenty minutes away by car. The ancient Celtic circular stone and thatched roof dwellings (pallozas) of O Cebreiro are only a short drive away in neighboring Galicia. The stone and slate covered Parador offers rooms with large windows that face the steeply terraced vineyards to the south, simply gorgeous in the fall, and the densely forested Ancares Mountains to the north. The Parador, with two seasonal swimming pools, opens on the 2nd of March this year but closes from 3 November to 31 December this year. Wine production flourished here during the Roman occupation and in the 9th century regained prominence with the discovery of the remains of St. James in Galicia and the building of monasteries and pilgrims hospices along the pilgrimage route, the Way of St. James. Monks kept winemaking alive and well throughout the Middle Ages, but the production died off at the end of the 19th century with the arrival of phylloxera. It was resurrected once again in the mid 80s with the arrival of young, energetic winemakers like Alvaro Palacios, who, after bringing fame to the Priorat, has helped make El Bierzo one of the most exciting winemaking regions in Spain. El Bierzo sits in a square-shaped fertile valley protected by mountains on all sides, giving it a benevolent microclimate perfectly suited for wine production. The indigenous mencía grape, covering two-thirds of its vineyards, thrives in these precariously steep, high altitude, slate-laced hills. You can read “Travels in El Bierzo” for more information on this emerging wine region. The Ribeira Sacra boasts two equally wonderful, historic Paradors in strikingly different settings from which to use as a base to exploring this wine region. The first, sitting atop a hill overlooking Monforte de Lemos, is the historic site of San Vicente do Pino with its medieval castle keep, 17th century Benedictine Monastery and Palace of the Counts of Lemos, which now houses the elegant Parador de Monforte. You’ll find a very friendly staff, serene and beautiful cloister and a seasonal outdoors pool. Plus, the Ribeira Sacra’s most acclaimed restaurant, O Grelo, is just a few minutes walk from the front door. Here diners can feast on Galician specialties such as oven-baked baby scallops, octopus, Cedeira goose barnacles, monkfish and sea bass, accompanied by fine wines from all of Galicia’s acclaimed appellations. A spectacular white wine to accompany this seafood feast is Pena das Donas Almalarga Godello, which one can purchase from the Centro del Vino in Monforte’s town center. The other option, in contemplative isolation, concealed within a chestnut forest to the west, is the Parador Santo Estevo. The Benedictine Monastery of Santo Estevo de Rivas de Sil, dating from the 10th century, provides a peaceful and relaxing retreat in its secluded setting in Nogueira de Ramuin, a 30-minute drive from the regional capital of Ourense. 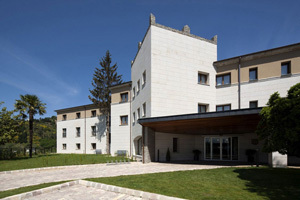 In its recent conversion to a Parador, it has retained the medieval elements of the original building, including the three lovely cloisters (Romanesque, Gothic and Renaissance) and the original chapel, while adding a dramatic architectural touch in contemporary steel and glass, avant-garde furnishings in the 76 former monks’ cells, and a seasonal spa. In addition to the renovated monks’ cells, there is one suite, room 210, Abad Franqula, named for the first Abbott of the Monastery. The most spectacularly scenic region of Galicia, the Ribeira Sacra D.O., is found on both sides of the steep canyon walls of the Sil River, the natural boundary between the provinces of Ourense and Lugo, and west along the banks of the Miño River Valley. This is a region known for its vertiginously steeped, strikingly beautiful vineyards, the oldest of which were carved out by the Romans 2,000 years ago, scenic and quite dramatic lookouts, castles, jewel-box Romanesque churches, and ancient Cistercian monasteries, all reached via country roads running through lush forests. Artists will enjoy shopping for pretty traditional rustic pottery in the ceramic towns of Gundivós and Niñodaguia. Nature lovers can take a leisurely catamaran cruise through the river canyons, and the more adventurous can enjoy white water rafting along the Miño. After soaking up the dazzling autumn colors in the Ribeira Sacra, we turned southeast for an overnight detour in the historic castle town of Bragança, but before then, we stopped in one of the most charmingly picturesque mountain villages in the Zamora province, Puebla de Sanabria, where the local restaurants were celebrating wild mushroom, game and truffle season. The Puebla de Sanabria Parador is located in a spectacular spot, above the Tera River Valley, and the town serves as the gateway to the Sanabria Lake, the largest glacial lake in Spain. Nature lovers find plenty of hiking trails here, along with a highly picturesque medieval quarter of half-timbered homes and cobblestone streets. Although this Parador is of sleek, modern design, it enjoys a convenient, easy-in, easy-out location just below the medieval village with picture postcard perfect views of the town’s carefully restored 15th century castle. Leaving Puebla, we continued south through the beautiful Montesinho Nature Park, which forms the natural border with Spain in the historic and still somewhat remote region of Trás-Os-Montes in northeastern Portugal. After an afternoon exploring the interesting and well-preserved medieval quarter of Bragança, we spent a relaxing night in the Pousada de São Bartolomeu, one of the Portuguese cousins of the Paradors of Spain, with its commanding view of the “Torre da Princesa”, the storybook Princess Tower. Our next stop was Zamora, at the Parador of the Counts of Alba and Aliste, a richly decorated 15th century Renaissance palace sitting on a pretty square in the center of this historic provincial capital. The feel inside is one of fading medieval grandeur, with its display of coats of armor, heraldic shields, banners and tapestries adorning the glass-enclosed courtyard, and canopy beds in its superior rooms. Zamora is located at the crossroads of the Vía de la Plata on the St. James pilgrimage route and is a living Romanesque Museum, as it is richly endowed with a wonderful collection of more than a dozen pale stone, superbly preserved Romanesque churches. The city serves as a fine base for both wine and cultural touring, as does its neighbor to the east, Tordesillas, which played a major role in world history when Queen Isabella and Ferdinand sat down with the King of Portugal in 1494 to work out a treaty that would divide all of the lands discovered in the New World. While Portugal won Brazil, Spain got much of the rest. The Parador of Tordesillas, housed in an ochre-toned ancestral Castilian home in the shelter of a pine forest, sits midway between Zamora and Valladolid and provides tranquil gardens, two pools, a Turkish bath and sauna and a children’s playground, inviting travelers to rest and relax. It serves as an excellent base from which to visit both the architectural treasures of Old Castile, such as the Royal Convent of Santa Clara in Tordesillas (a jewel of mudéjar art, called the “Alhambra of Castile”), the Colegiata de Santa María la Mayor, with its glorious polychrome Romanesque portal, in the town of Toro, Valladolid’s acclaimed National Museum of Sculpture and the former homes of Columbus and Cervantes and the castles of Simancas and Medina del Campo. Plus the wine producing regions of Rueda, Cigales, Toro and Ribera del Duero are all within an easy drive. From Tordesillas we made the quick drive to Valladolid’s rail station and zipped back down to Madrid on the high-speed AVE.